Strollers for Twins are an Absolute Must-Have Twin Baby Gear Item. Make Your Life with Twins Easier with Our Top Picks from the Tandem and Double Strollers on the Market. But how do you choose the BEST stroller for your little ones? Trust me, buying the wrong stroller is a costly mistake that will drive you crazy every time you take your little ones out with you - eventually desperation will drive you to buy another one - I only got it right on the third attempt! Feel free to submit a review of your own strollers for twins as well. It's easy to do and we value your advice and willingness to share with other parents. A tandem or duo stroller has one seat situated behind the other. The big advantage of this model over the side-by-side version is that it is narrower and will fit through doorways, down aisles and through crowded areas without any problem. The disadvantages are that it can be difficult to steer round corners because of its length, and sometimes only the back seat is fully reclinable. (Check this on any model you plan to purchase.) In addition, the storage compartment can be difficult to access, usually only the front seat has a snack tray and there is often restricted leg room in the back seat. A double or side-by-side stroller has the two seats next to one another. The main advantages of this model over the tandem stroller are that it is usually easier to maneuver, storage space is easier to access and your twins can interact with one another while they sit beside one another. Before you go twin stroller shopping you need to think about where and when you will be using the stroller. Will you be jogging? Will you be spending a lot of the time at the beach (like me!) or do you prefer the mall? How big is the boot space in your car? Do you need space for groceries etc. Depending on the answers to these questions some twin stroller features will be absolute necessities for you while others will be less important. Width. Do not buy a stroller that does not fit through a standard doorway - period! Maneuverability. Is the stroller easy to push and steer? Try it with one hand. Weight. Light weight strollers are great for malls and for getting in and out of the car. For rough terrain and jogging you may want something heavier. Folding. Look at the size when folded - will it fit your boot space? Does the twin stroller you are looking at have an easy fold or one hand fold mechanism? Storage. Look at the amount of storage under the seats and whether or not it is easily accessible even when the twins' seats are fully reclined. Some twin strollers have storage space behind the seats too. Seats. Look at width and number of backrest positions. Do the two seats recline independently of one another? Are the seat covers easy to remove for washing? Are there footrests for your little ones when they get older? How much leg room is there? 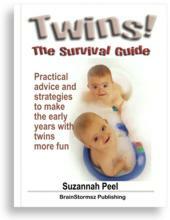 Can your twins see each other - this becomes important as they get older! Refreshment. Look for snack trays and cup holders. Don't forget to check if there is a cup holder for you too! Safety. Look at the safety harness and braking system. They should be easy to operate, reliable and sturdy. Weather protection. The canopies on some strollers offer more sun protection than others due to multi-positioning. Also check if you can get a rain cover to fit your twin stroller. Travel system compatibility. Some strollers for twins will accommodate snap in infant car seats. This enables you to move your babies from the stroller to the car without waking them - great for short trips. Do you have a favorite stroller for twins that you couldn't do without? Let us know and write a review of your favorite twin stroller. You'll receive a free ebook! Now you know what's out there - happy shopping! Take your time. Your twin stroller is one of the most important purchases you will make for your little ones.